Indian Railways has developed the first ever air conditioned coach (car)for its DEMU trains. Till now the existing DEMU trains consisted only of non-air conditioned coaches. The first ever AC coach has been manufactured at Indian Railways’ Chennai based Integral Coach Factory (ICF). Existing 8-coach DEMU train will have 2 such newly developed AC coaches. Soon such DEMU trains will be rolled out for passenger services. 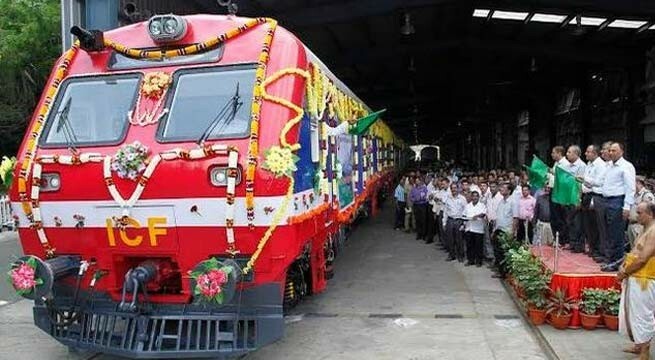 Integral Coach Factory (ICF) has planned to roll out 4 DEMU train sets each provided with two AC coaches. Further manufacture of these trains will be based on the feedback from users. These air conditioned coaches are provided with 5 comfortable reclining cushioned chairs arranged in each row(2*3 confg) with total capacity to seat 73 passengers. The interior furnishing of these AC coaches is similar to that of intercity AC express train coaches. All AC coaches are equipped with environment friendly bio-toilets. Indian Railways presently run three type of DEMU trains namely: 6- coach DEMU train with 700 hp, 8- coach DEMU train with 1400 hp and 10- coach DEMU train with 1600 hp.